Today's New Band To Burn One To, Made In China, originate from Dunedin, New Zealand. Reiterating all we love of early '90s hard rock, sludge, and doom all while adding their own spin. Known for their dynamic performances, you don't want to miss these guys! "Purveyors of fine heavy rock, sludge and a little bit o' good old fashioned doom since 2007... Live and touring fiends, in fact, just generally fiendish. Do not expose to explosives, fumes, or disco balls. May be fatal to the pretentious, shoe-gazing, or musically unmotivated. Made in China toured NZ in April / May 2009, promoting their "Heavy Low" EP, and again in October, promoting their "Letters to the Dead" Sampler. 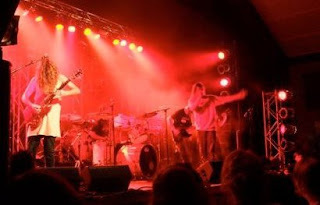 Previously, the band had toured the South Island twice, (latterly as guests on NZ metal heavyweights Sinate's Final NZ tour), and played a swathe of local shows in 2007 / "08. The band is currently in pre-production for a debut full-length, due mid 2010"
"As anyone who has experienced Made in China's explosive live shows can attest, this is a band worth paying attention to. They've been in the lab brewing something fearsome - an album which captures the signature raw power, technical skill and intensity of their performances. The Dunedin band’s first full-length release, Vice, showcases their heavy, layered and innovative rock sound. Chunky riffs and stomping rhythms combine with psychedelic elements to take the listener on a sonic tour, which references rock, blues, grunge and doom inspired influences. The Vice Album Release Tour kicks off on 23 September 2011, and follows Made in China's three previous national tours promoting their E.P. (Heavy Low, 2008) and two samplers. Made In China has previously opened for acts including The Datsuns, Luger Boa, Tainted and Sinate - they will now be supported on the Vice tour by some of New Zealand’s finest underground rock acts."